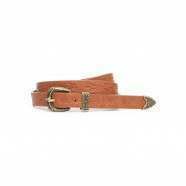 Wolf & York Belts - Wolf & York Endless Summer Leather Belt - Chocolate Floral :: Women > Belts. Exclusive to SurfdomeWomen's beltMaterial: Leather. metal bucklePairs great with light-coloured trousersPretty blossom and floral motifDurable. oval metal buckleHigh-quality leather Size: Large,Medium,Small.